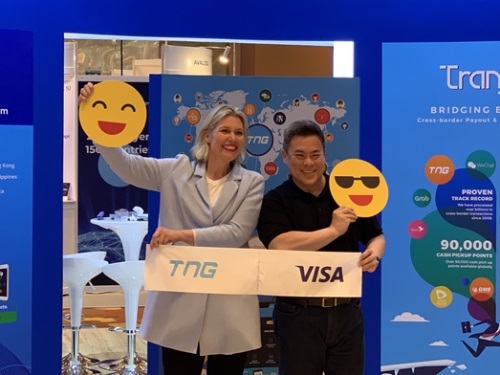 HONG KONG and SINGAPORE – (ACN Newswire) – TNG FinTech Group (“TNG”), Asia’s leading Fintech company, has teamed up with Visa, the global leader in digital payments, to launch prepaid solutions in six target markets across Asia, in a move that will further expand digital payment services in a region where adoption of digital wallets is gaining traction. The two companies officially revealed their partnership during the world’s leading Fintech event Money 20/20 Asia in Singapore. The TNG and Visa partnership will explore enabling secure payment for online and face-to-face for the underserved as well as unbanked segments in the region. The prepaid payment solutions aim to tap into Visa’s worldwide acceptance network and will be integrated into TNG Wallet. As a participant of Visa Fintech Fast-Track Program, launched last year, TNG can tap into Visa’s global network in as little as four weeks. The fast-track program provides a new commercial framework that includes access to Visa’s payment capabilities, competitive fees and streamlined processes, tailored to Visa’s fintech partners’ needs. The program also links fintechs to platforms that are already certified by Visa and connects fintechs to sponsoring banks.